Opening burning in Illinois is regulated by the Illinois Environmental Protection Agency (IEPA) and the Illinois Pollution Control Board. According to the Illinois Environmental Protection Act (415 ILCS 5/3.300), opening burning is the combustion of any matter in the open or in an open dump. Prohibited actions include open burning of garbage, construction/demolition debris, tires, and asbestos-containing material. Open burning by businesses is also illegal, with exceptions for landscape waste generated to maintain the property and agricultural waste generated on-site under limited circumstances. It is also illegal to burn anything except landscape waste within any Illinois town or within one mile of a town with a population of at least 1,000. IEPA does issue permits for burning activities for some situations, including fire fighter or fire extinguisher training, prairie & ecological landscape burns, disaster debris burning, and burning landscape waste with an air curtain destructor. Appropriate permits must be completed and submitted by the applicant. Local ordinances with further restrictions on burning may apply during certain times of year. Please consult with your local city agency for other restrictions. More information regarding open burning in Illinois and open burning permit application forms can be found on the Illinois EPA website. 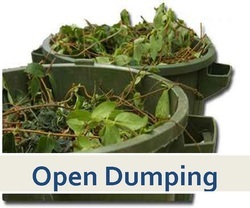 Open dumping can create a public nuisance and can pose hazards to people and the environment. The Illinois Environmental Protection Act prohibits the causing or allowing of open dumping or waste. The landfilling of used oil (Section 21.6), landscape waste (Section 22.22), lead-acid batteries (Section 22.23), and restricted landfilling of white goods such as refrigerators, freezers, water heaters, and other similar appliances (Section 22.28), tires (Section 55) is prohibited by the Act. These are just a few actions prohibited under the Act and is not an all-inclusive list. Local ordinances with further restrictions on open dumping and waste removal may also be in affect. Please consult your local agency. Asbestos is a mineral that is naturally occurring and has been found in roofing/flooring products, fireproofing materials, as well as other products. Asbestos was once commonly used in many building materials because of it's insulating properties and high strength, but it's use in materials declined due to asbestos being found to be a serious indoor air pollutant. 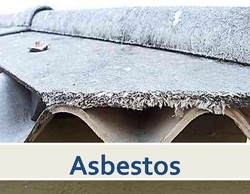 Asbestos has also been used in products such as roofing compounds, gaskets, and friction products (ex. brake shoes). Respiratory diseases such as lung cancer and mesothelioma have been linked to asbestos exposure. While no specific "safe" exposure level has been established, increased exposure leads to increased risk of disease. The Illinois Department of Public Health licenses those who work in asbestos abatement, air sampling, and inspectors. The Asbestos Abatement Act and the Commerical and Public Building Asbestos Abatement Act regulate activities related to asbestos abatement and licensing. More information can be found on IDPH's webpages on asbestos and asbestos in vermiculite. Mercury is naturally occurring metal that is a liquid at room temperature. It is a shiny, silver color. 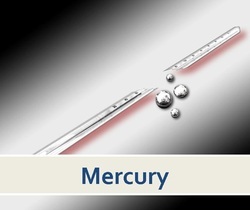 Mercury is commonly used in instruments such as thermometers, blood pressure instruments, barometers, and other instruments used to sense pressure. Batteries, fluorescent light bulbs & CFLs, and other products may also contain small amounts of mercury. Mercury exposure occurs by breathing small amounts of vapors, eating or drinking contaminated food or water, and by direct contact. The amount of mercury you're exposed to, how long exposed to it, and how you were exposed to it can all affect how your body is affected. Negative effects to the brain, kidneys, and lungs are possible with mercury exposure. Other symptoms such as diarrhea, nausea, rashes, eye irritation, and muscle tremors may also occur. Children are generally more susceptible to the effects of mercury exposure than adults. Proper cleanup of mercury spills is important in helping to prevent mercury exposure. IDPH has information regarding mercury in schools and mercury spills. Energy-efficient compact fluorescent light blubs (CFLs) are a source of very small amounts of mercury vapors in the home. When these bulbs are broken, a small amount of mercury vapor could be released. Proper handling and disposal of CFLs is important to help prevent mercury exposure. More information about CFLs can be found on IDPH's webpage on CFLs . Carbon monoxide (CO) is a colorless, odorless gas that has been known to cause illness and death. CO gas is found in fumes produced by such things as automobiles, stoves, burning wood, and heating systems. In enclosed spaces, these fumes will build up and can cause CO poisoning. All people are at risk of CO poisoning, especially those who may have weakened or underdeveloped immune systems. Many are poisoned accidentally with the most accidental poisonings occurring from December through February due to the reliance of heating with furnaces or warming up cars in a garage. DO install battery-operated CO detectors in your home, especially near heating sources. Change the batteries in the detector when you change your clocks from daylight saving time to standard time. DO have a qualified technician check your heating systems, water heaters, and other gas-, oil- or coal-burning appliances every year. DO have your chimney and flue inspected and cleaned yearly. DO make sure that your chimney is not blocked with snow before you use your fireplace. DO move to a fresh-air location and call 911 immediately if you experience the symptoms of CO poisoning. DO check frequently on children and the elderly. DO NOT use gas-powered appliances such as ranges, ovens, or clothes dryers to heat your home. DO NOT use camp stoves, charcoal grills, or hibachis inside your home, in the basement, or in the garage. DO NOT operate a generator inside your home or garage. Only operate a generator outdoors and away from doors, windows, and vents that could allow CO to seep indoors. DO NOT run a vehicle inside your garage, even if the garage door is open. More information regarding carbon monoxide poisoning can be found on CDC's Carbon Monoxide webpage or CDC's feature page on carbon monoxide poisoning. Radon is a colorless, odorless, radioactive gas in the soil that comes from naturally occurring uranium in the soil. This gas can build up in your home and has been shown to cause lung cancer. Radon can enter your home due to air pressure and temperature differences between inside and outside the home. The only way to know if you have radon in your home is to test for it. Radon test kits may be available at various places such as hardware or home improvement stores or from various agencies. A list of radon measurement professionals and sources of radon test kits and testing can be found on IEMA's website. They do not endorse any company and simply provide the list as a service to the residents of Illinois. IEMA also guidelines for measuring radon in the home.